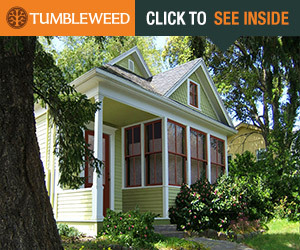 #TinyHouseNation Casting Call: Planning to build a tiny home? We Want You! “TINY HOUSE NATION,” the buzzworthy new show correctly airing on FYI (an A&E-owned network), is seeking people who are obsessed with the tiny house movement and want to build and live in a tiny house of their own. Participants will be paired with an expert team of builders and designers who create one-of-a-kind and fully functional layouts that maximize small spaces while also significantly increasing the value of the properties. Interested individuals, couples and families should be located in the US and able to purchase and/or build a tiny house between August – October 2014. Produced by Loud Television (a Leftfield Entertainment company), “TINY HOUSE NATION” features renovation experts, John Weisbarth and Zack Giffin, as they travel across America to help people design and construct their own mini-dream home in a space no larger than 500 square feet. and why you are choosing to live in a tiny home. Thanks to everyone who is helping spread the word. The maps below show recent visitors to this page. Click either map for a larger gallery view. I am a nurse who works at a non profit primary care clinic serving mostly Hispanic immigrant workers. I am 28 years old and live in Portland, Or. In my spare time I like to play indoor soccer and go to craft camp. I am looking to build a tiny house in this tiny city. Are you still taking casting calls? You’ll want to check on their website, but I think they aren’t taking on more people. We continue to have similar opportunities, so sign-up on the website for updates. Hi..I am a single 53 yr old woman, and I suffer from a disease named Reflex Sympathetic Dystrophy Syndrome (RSDS)..I am losing my ability to walk. I currently am in a wheelchair 90% of the time. I work from home, and have 2 dogs…one is a mere 15-17lbs…the other is a Greatdanoodle (1/2 Great Dane and 1/2 Standard Poodle) a mere 105 lbs. I need a tiny home that will allow me to continue to live independently. I want a 450 sq ft tiny home that will be TOTALLY wheelchair functional!!! Bath, Kitchen, Office, and one thing I do NOT need is a bedroom! I am not able to sleep in a bed anymore due to my health..I have slept in a recliner for the last 3 yrs.! I was a Personal Chef for years of my life, but have not been able to cook for a year because I just can’t work in the kitchen as I need to. I must have wet bath..that will allow me to take a bath safely alone, and a safe shower. I also want to make sure that I can live 100% off grid! I want a deck that will allow me to be with my dogs outside, and also sit by a fireplace in the Fall and Winter!! I have always loved small spaces..I cannot stand waste…I am a true green lover… I do not want to lose my independence…and I do not want to live off the government on disability…and I require a small amount of most everything to be happy!! I have spent years researching off grid living, and tiny home living! I have spent a long time trying to just survive…but I have decided that I WANT TO LIVE AGAIN!!! I WANT TO LIVE BIG, IN A TINY HOME! Can you guys PLEASE HELP ME??? How awesome it would be to provide disabled people in chairs to continue to live independently!!! Thanks for writing. I don’t believe that the producers of the show are reading the article we posted here on our website. As mentioned in the article, you’ll want to communicate with them directly. There is no email address on the website? Thanks for writing. I don’t think that the producers of the show are reading the article we posted here on our website. As mentioned in the article, you’ll want to communicate with them directly. The email address is provided above in the article. That sound great…I have a family of six…My five kids and I. It would be amazing to see how Zach would configure each of us in a separate bed and how much space would be needed or utilized comfortably in a movable trailer… I truly love this show! You might also consider getting in touch with some of the builders that are out there. Thanks for writing. I don’t think that the producers of the show are reading the article we posted here on our website. As mentioned in the article, you’ll want to communicate with them directly. 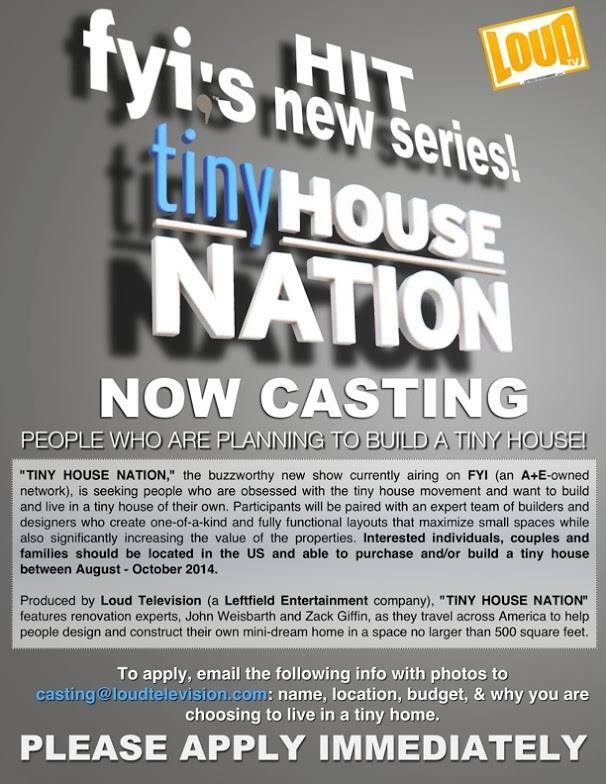 I am curious how to apply for future casting calls for tiny house nation? Hello i’m a huge fan and I came up with an idea that may help people in tiny homes that have a lot of shoe or devices and not a lot of space you could put pockets on the curtains which will in crease the storage. Please use my idea to help people in their new tiny homes. I’m wanting to have a tiny house built. Me and husband does not need a big house to live in. I am wanting zack with tiny house nation too do it. 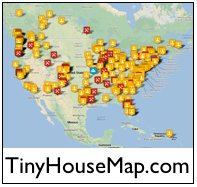 We are looking for 2 separate tiny houses facing each other in Tennessee area with a budget of $150,000.00 for both houses. Any ideas? Any chance they are taking on more people to build tiny houses for the show? I live on the island of Kauai in Hawaii and am a single mom planning to build a tiny house for me and my 6 year old son on a permaculture farm this fall of 2015. I would LOVE for the guys to come out and build our house! Please!!!! We would love to build a tiny home!!!! We have a budget of 60,000 in the mountains of Idaho!!!!! Hi, my name is Jennifer and I live in Green Bay, Wisconsin. I have carriage house in my backyard that was used as a pool house and workshop! I would love to build it into a tiny house for my senior mothers to improve her quality of life as well as mine and my two children. Are you still taking casting calls? Ps. My mother loves your show! I wish I had the money to do this. Any chance of a contest to win a tiny house? I’m a single women with a cat who wants to build a house to meet her needs. Are you castincg for 2015? Artist, to be married soon to another artist, he has 2 boys 11 & 13. Need tiny house already built for the boys. We are located in conroe texas, I can’t find tiny house already built for sale in my area, can you help?? We will drive up to 200 miles to find it? Hello my husband David and I are interested in building a “Green”, semi off-grid tiny home of about 400 – 500 square feet in the Finger Lakes region of Central New York State. Our family currently resides in Maryland but we own 2 acres of property near Senema Lake NYS. Our goal is to build a tiny home that would support us throughout our retirement years. We wish to move to the tiny home in about 9 years as our primary residence, until then we would hope to go to our tiny home on long weekends and summer holidays with our teenage twin boys. Hello, I’m 35. I need a handicapp house that’s kinda tiny. I’m in a wheelchair usually and I have 2 kids, son is 11 and daughter is 10. Could it be possible to help us? Hi Michelle, The tiniest homes in terms of a small footprint generally have a loft area, narrow passageways, and aren’t entirely accessibility. To make homes accessible, it’s necessary to put everything on the same level, and have wider passageways. So, this makes the home slightly bigger. However, it’s still possible to have a smaller home, and save money that way. You’ll want to work with a local builder. Late to the tiny house movement we bought a tiny house for my 2 kids and myself a single mom small business owner in the crazy expensive market that is Silicon Valley. We are wanting and working to modify our triple listing home of 312 sqft, 515 sqft, 732 sqft depending on the source to be more efficient than the 1925 version. Just happy to have a yard and gardens and great schools in a nutty gentrified area. Trying to keep them both grounded with time in nature and with family, reading, and lots of volunteer work with Kiwanis, and MVPAL. Etc. Thanks for sharing! We wish you the best in your small house journey. Who were you trying to contact? Ever since I watched Tiny House Nation (I still watch every episode) and was able to look inside a tiny house I knew that a tiny house was for me. A tiny house is perfect for my daughter and me. I can’t believe some of the inventions Zack and the rest of the genius team has created for the tiny houses they have built. Now I’m spoiled and don’t want anyone else to build my tiny house. I was approved for $100,000 for a house. It’s impossible to find a house in that price range here in Salt Lake City, UT, but it’s a lot of money for a tiny house. A tiny house has many more pluses than a large house. First it takes less to heat and cool especially if you have solar panels. Second its smaller so it takes less time to clean and easier to keep clean. Living off the grid means that you are also helping the environment. I could go on and on with all of the pluses. As a retired nurse and now a senior citizen a tiny house is perfect for my daughter and me, just as long as the builders add hand rails to the stairs leading up to the front porch (its a senior thing). Do you guys also build houses in Australia? Its really important because I’m thinking about have a tiny house there. 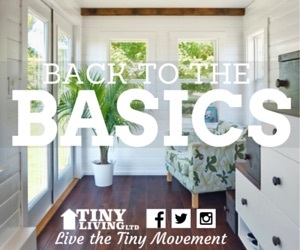 Tiny House Nation doesn’t follow this web page. You’ll want to write them directly. You’d need to contact the producers directly. They don’t read this page on our site. I have a EXCELLENT idea for a tiny house. This idea has to do with the placement of sleeping areas. Please contact me. I would love to share this idea with Zach seeing that he is the only one that I have watched that has the mechanical eptitude to make it work. Thank you for your consideration. I think a good idea also is to have a segment on the show where they take a letter from a viewer or a Question and answer from Zach. He is the true star of the show. Hi Cathy, Zach doesn’t read our website so you may want to contact him directly.